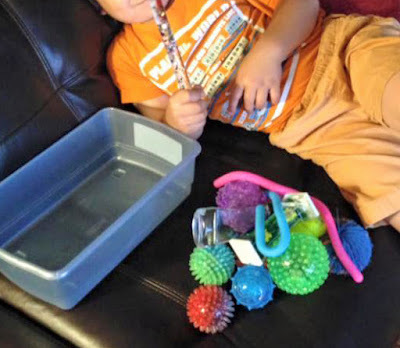 A friend (who isn't on FB and who also doesn't read my blog so never knows I talk about her quite regularly in my posts) told me about the calming buckets she'd made for her kids to use whenever they just needed to chill out. In each bucket is a collection of fidgets and art supplies for each child to use for as long as they needed in order to become human again after a meltdown or argument. I liked this idea a lot. But, I also knew that, since I am not nearly as organized as my friend, there wasn't enough room on top of the refrigerator or in my closet for three whole buckets of stuff and that if I didn't put them in either of those places, the items would disappear almost immediately into the flow of toys, books, papers, and pens that always seems to be migrating around the house. Still, I liked the idea of giving the kids an emergency kit to use BEFORE their behavior devolves into a big fat mess of screaming/crying/fighting, which is what seems to happen most evenings just about dinner time. So, last weekend, while I was waiting for Pink P to finish at a friend's Chuck E Cheese party, I went to the dollar store and bought a bunch of tactile balls. Then I went online and ordered a couple of liquid timers, some stretchy string, and a glitter wand. Altogether, I spent about $15. One shining moment: the box of stuff. 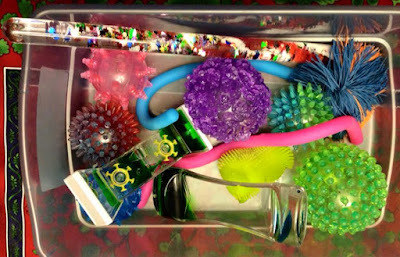 When the stuff arrived, I threw it into a box that was both smaller and a different color than all of the other sensory boxes. Then I sat the kids down and went over the ground rules. "THIS," I declared, "is our emergency sensory box. When you feel like you want to yell or cry or hit, I want you to get this box, take it to the couch, and spend as long as you need to calm down." They were rapt with attention--you know, when they weren't trying to fight jockey with each other to be the first to grab one of the bright shiny sensory balls. "But, WAIT," I continued. "There are some rules. First, you can only use this box when you are sitting on the couch. Second, you cannot throw the balls, and third, everything must go back into the box when you are done." They seemed to understand. They really did. But then all of the balls disappeared and the stretchy strings were turned into lassos and the whole thing fell apart, It turns out that missing emergency sensory box balls are perfect triggers for mom-sized meltdowns. Who knew?